A few years ago, Texas caviar could be found in the salad section of every grocery store and free standing deli in our area. I don’t remember exactly how the stuff from the different delis was made, and I was planning on buying some in an attempt to reverse engineer it. Unfortunately, I noticed that it’s not in the deli cases anymore. Since I was working through my 30 days of beans, I decided to try my hand at recreating the recipe. The only things I knew with any certainty was that it contained black eyed peas along with chopped onion and bell pepper. I started there, and just kept adding things until I was satisfied with the results. The final bowl of “caviar” was cool and refreshing, but a little spicy. Basically, it was really good. If you don’t like heat, use less Louisiana hot sauce. 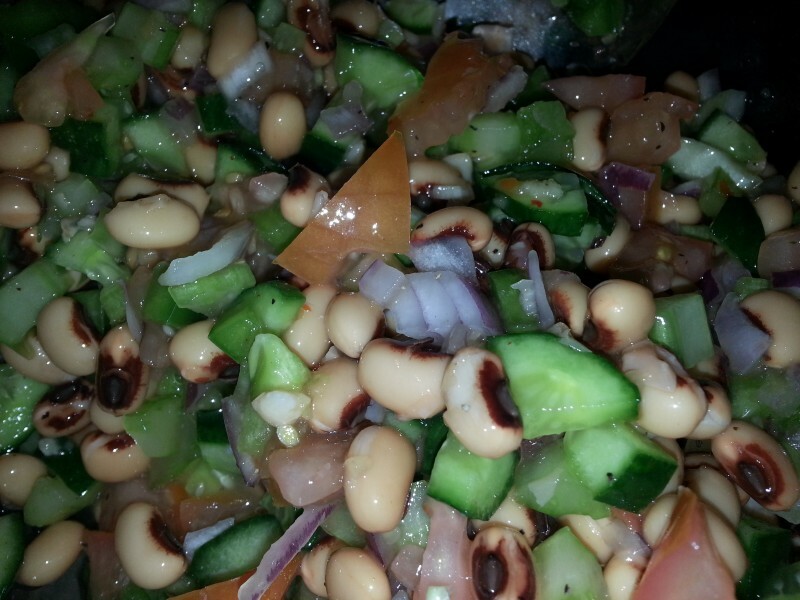 The best part about Texas Caviar is that it goes together quickly and makes a great side to serve at a barbecue. It’s also good served with some tortilla chips or piled onto green salad. The recipe makes about a quart. I don’t want to be predictable, but I stored the salad in a quart sized mason jar until it was time to serve it. Here’s your printable recipe. Give it a try and let us know what you think. Has anyone else made Texas Caviar? Do you do anything differently? I’d love to hear from you. 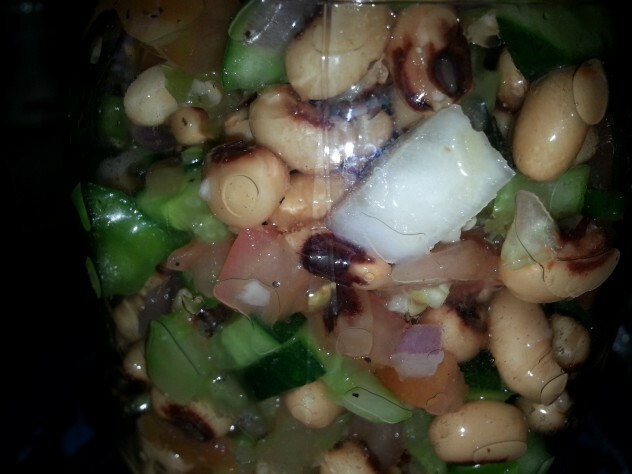 Black eyed peas are combined with chopped vegetables, prepared salad dressings, and some Louisiana hot sauce to make a delicious and refreshing salad that's sure to be a hit at your next barbecue. 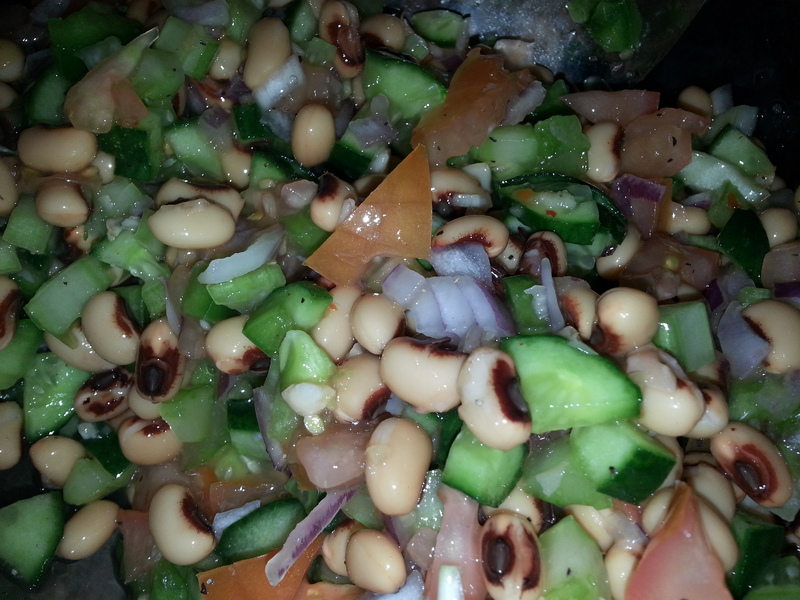 Add black eyed peas, black pepper, Italian dressing, and Louisiana hot sauce to the bowl with the vegetables. Mix well and chill for two hours before serving. Your caviar recipe definitely reminds me of the way I ate peas when growing up in Texas. Actually, it makes me think of the Chow-Chow we served with all types of peas and some beans. I have never heard of chow chow. Is it a bean salad?